Well, I've been making the same post about this drama for the third time (ended delete my previous two posts). I was confused at first whether or not I should write another k-drama review, because my last one seems make some people confused hehehehe. Rather than saying it's a review, I prefer to called this kind of post a rant post. How I feel when I watched a drama, how I feel about the story and about everything. 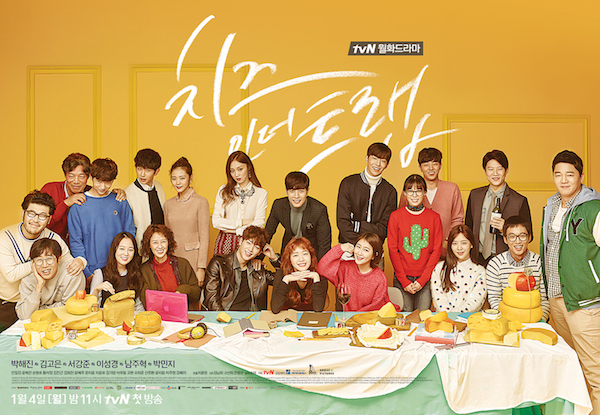 This time I will talk about Cheese in the Trap, for those who are not into k-drama, this drama is quite popular these days. Based on webtoon (I don't read the webtoon, though) and I think the plot is very interesting. Not like the usual romantic drama, but more dark and complicated. But, still it shows a lot of romantic scenes with its own style. Truthfully the story is simple, it's about a college student that has a relationship with her senior. Hong Seol (the student, girl) tends to work hard on everything especially her study. When the others are lazy and not doing their job, she ended took every responsible and finish it. While Yoo Jung (the senior, boy) is the type of nice guy, handsome, rich, and also clever. Perfect boyfriend style. At first I thought the story will be like the other drama, where the rich guy fall in love with a poor girl and completely going crazy and the parents are opposed,etc. But, this drama show me another plot. When usually the main character show a good personality and nice aura, Yoo Jung is completely different. He has a dark side of him. He show his affection in different way, unlike the others. He is kinda strange but in a good way. I don't know how I should called it, but in my opinion, Yoo Jung character looks natural, like person that you meet in daily life. Not a character that build by the scriptwriter. Hong Seol too, is no different. She encounter some strange behaviour of her boyfriend. She also heard gossips about him. People tell her the bad things about him. She believed in those and try to confront it with her boyfriend. She got mad, but ended realize that all he did was for her. Somehow, it likes watch a real situation in real life, isn't it? Sometimes we get angry at someone without really understand the real reason and ended regret it because we are wrong. Their relationship is kinda different with the other, but they do like each other and care for each other with their own way. This film teach me that I shouldn't judge people quickly. Everybody have their own reasons, everybody have their own problem. Just because something doesn't works like we planned, doesn't mean it works bad. We simply must look everything from another point of view. Do you watch this drama too? Me too! I especially love the plot! Yaampun komen aku kayak anak abg banget ya. Tapi memang ide ceritanya bagus banget sih ini.